Million Robot March against the University of Iowa’s pink locker room for visiting teams at Kinninck Stadium. What’s with all the fuss over the University of Iowa’s pink locker room? 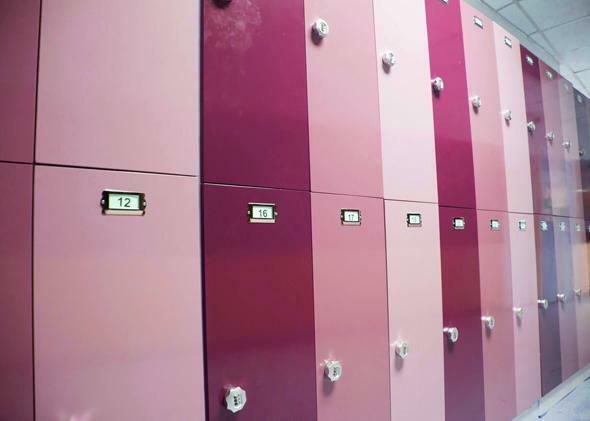 Do you find this stock photo of pink lockers calming? For more than three decades, the walls of the visitors’ locker room at the University of Iowa’s Kinnick Stadium have been pink. When the football stadium was renovated in 2005, the university took the theme even further, adding new lockers, showers, and urinals all featuring various shades of the color. While it remains a beloved bit of visual smack-talk for many Hawkeye fans—and was even featured in a recent ESPN ad about college traditions—some students and faculty have decried the color scheme as sexist and discriminatory. Recently, demonstrators dressed as robots marched on the campus to protest the locker room’s enduring paint job. “I wanted to mix fun and activism by fighting absurdity with absurdity,” Kembrew McLeod, an Iowa communications professor and the organizer of the march, wrote in a recent opinion piece. McLeod has a history of dressing as a robot to raise awareness about social issues, previously donning his costume to heckle the likes of President Clinton and Michele Bachmann. His newest robotic prank, called the “Million Robot March Against Pink Locker Rooms,” coincided with FRY Fest, an annual celebration of Iowa football and of onetime Iowa football coach Hayden Fry. It was Fry who first had the locker room painted pink in 1979. “There is no denying that Fry’s tactic is rooted in an antiquated age when homophobic and sexist epithets were the norm in sports,” McLeod wrote. The protesting robots may amount to little more than a metallic annoyance for the university and football fans, but others critical of the locker room have warned of more serious action. Since 2005 Jill Gaulding, a former University of Iowa law professor, has threatened to sue or file a federal complaint against the university under Title IX of the Education Amendments of 1972, the law that forbids gender discrimination at colleges. Gaulding, who is now a lawyer with the nonprofit law firm Gender Justice, said the “discussions are still ongoing,” and that the locker room’s color is a type of gender slur. In order for a discrimination lawsuit to have any legs, she said, a plaintiff must prove that the university intended to discriminate. And Iowa administrators continue to insist that the color of the locker room is not discriminatory but psychological, and have made clear that the locker room is not going anywhere anytime soon. There is some limited research on the emotional effects of a certain shade of pink known as Baker-Miller, or Schauss, pink. Those researchers believed the hue to have a calming or weakening effect. Alexander Schauss, the researcher for whom the shade is named, once likened it to a tranquilizer that “saps your energy.” The color can be found covering the walls of some “drunk tanks” and jail cells, including most famously (and at Schauss’s insistence) those at the United States Naval Correctional Facility in Seattle. The University of Iowa is not the only team that has used pink to intimidate opponents. In the early 1990s, Colorado State University had a pink locker room until the Western Athletic Conference decided that home and away locker rooms must be painted the same color. Opponents of the South Bend Silver Hawks, a minor league baseball team, also take their postgame showers surrounded by the color. In 2012 a family in Bondurant, Iowa, that donated $3 million of its Powerball winnings to help build a local high school’s new stadium had a caveat: The visitors’ locker room had to be pink. Fry, the revered Iowa football coach, hinted at a deeper psychological reasoning behind the color in his 1999 memoir, but then undercut that explanation by still associating the color with girls. At one point, pink was actually more often found in boys’ rooms, and conventional wisdom dictated that it was a “boys’ color.” The June 1918 issue of the children’s market trade publication Earnshaw’s stated “the generally accepted rule is pink for the boys, and blue for the girls.” That changed around the 1940s, and pink and girls have been closely linked ever since. It’s an association, Gaulding said, that leads most fans and players to one interpretation of the locker room’s color: Pink is for sissies.